Panel Built does it again! Insurance Office of America VP Jason Peacock presents a plaque recognizing two years with no lost time accidents to Panel Built Safety Officer Teresa Dedman. 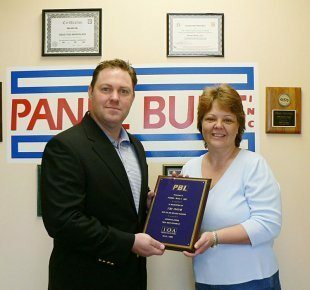 Blairsville manufacturer Panel Built, Inc. received another impressive award on Wednesday, March 13, 2008. They were presented with a plaque recognizing that they had gone over two years without a lost-time injury. According to Insurance Office of America representatives Jason Peacock and Tricia Hushmire, even a year without a lost-time injury is almost unheard of in manufacturing companies of similar size. Panel Built manufactures modular offices, mezzanines, stair systems, pre-assembled and exterior buildings, and is one of the largest manufacturers in Union County. “I’m proud of our company and the effort they have put towards this accomplishment,” said PBI Safety Officer Teresa Dedman.